The Plyo Press bridges the gap between speed and strength, giving athletes distinct lower-extremity training. More effective than squats and leg presses, the Plyo Press activates the greatest muscle activity possible. Athletes benefit fully from the Plyo Press as it promotes intense and dynamic exercise. The machine also allows injured athletes to start their rehabilitation and range-of-motion exercises before they are fully weight bearing. 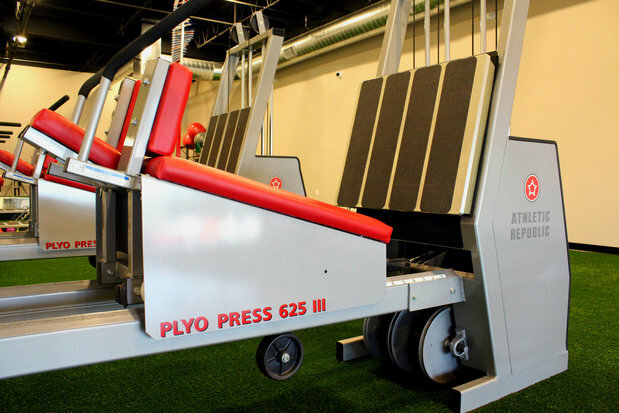 The unique design of the Plyo Press allows athletes to take explosive power training to a higher level. The footplate angle puts the athlete in an athletic position to produce force through the balls of his/her feet - not the heels like a standard squat exercise. You compete in an athletic position, you need to train in those positions. The sled supports the low back and reinforces proper mechanics when lifting heavy weights or doing explosive jumps. Using an exclusive weight loading pattern, the PPM provides variable resistance that optimizes the weight load based on how the body works. Versus squats and hip sleds, the PPM is a safer and more effective way to train lower body explosive strength and power.